Abalone Cove (along with Sacred Cove) beach is part of the Abalone Cove Ecological Reserve and can offer you tide pools, bluff top viewing areas and trails. Besides, you can admire all the sea caves, black sand and rare plants, without mentioning its location on the Palos Verdes peninsula that gives it some of the best views of Catalina Island you'll find anywhere. Good waves don't arrive often at Abalone Cove, but when they do the locals come out in numbers and enjoy the break. The area is best for experienced surfers. Sharp rocks pose a hazard. 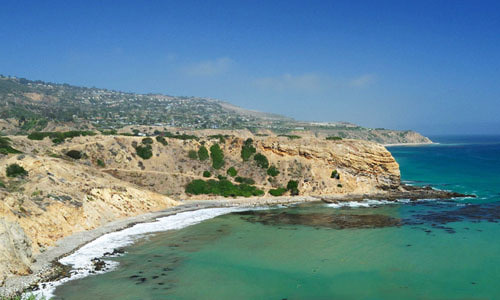 With the surf usually fairly gentle, Abalone Cove is an easy place to enter the water. Diving depths there range from about 12 feet to more than 50. Currents are not usually a problem. 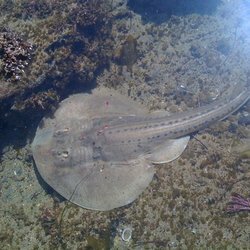 Divers are rewarded with a variety of sea life from giant crabs and sheephead to horn shark and electric torpedo rays. Abalone Cove Shoreline Park serves as the parking area for Abalone Cove Beach and Sacred Beach and for hikers in the Abalone Cove Ecological Reserve. The trail to Abalone Cove Beach begins at the parking lot in Shoreline Park. To reach Sacred Beach, visitors must walk ¾-mile along Palos Verdes Drive South to the trailheads above the cove. Also LA Metro Bus 344 takes you there.